Whether you prefer a mountain bike or a racing cycle, Liguria offers many different tracks. The bike and Liguria - the perfect combination all year round! Mountains and the sea define the wonderful landscape of the third smallest region of Italy. Get cycling and explore the region from a different perspective. Discover the beauty of the landscape and experience breathtaking natural backdrops up close. Whether you choose a relaxing ride along the sea or an up and downhill cross-country mountain bike tour - Liguria offers the best conditions for all cycling fans. Many professional racing cyclists train here to get fit for the next big tour. The mountains make sure that high-altitude workouts are sufficiently included. One of the most well known cycle races that pass through Liguria is the Granfondo MAILAND - SAN REMO. 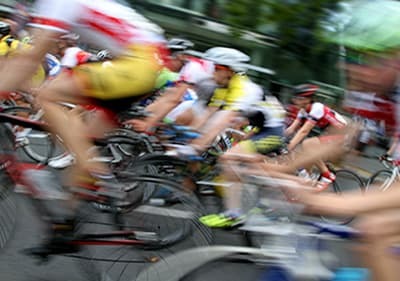 It is the longest long-distance cycle race in the world, covering a total of 296 km. every year, usually in springtime. More than 1000 athletes take part each year to complete the course together. If you prefer your own individual tour, the scenic road from Imperia via Poggi and then towards Dolcedo is one of the most rewarding routes for racing cyclists. Mountain bikers will equally enjoy an outstanding experience in Liguria. There is a great variety of tours through the hinterland, as well as mountain bike parks near the coast (e.g. in Diano Marina), where you can show off your skills. 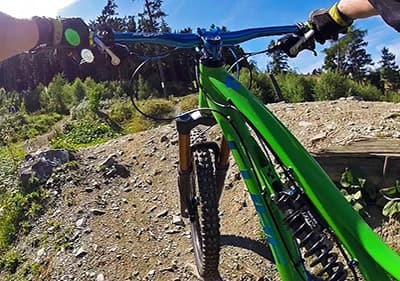 As a keen mountain biker, you really don’t want miss the MTB route between Torria and Pontedassio and above the Finale Ligure, there are several exciting trails for different skill levels. We have compiled some of the most beautiful tours for different skill and fitness levels in the four regions of Liguria for the adventurers amongst you, who prefer to set their own challenges. 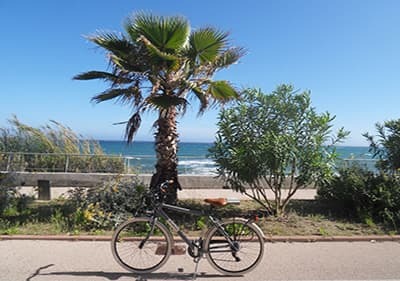 If youâre planning a cycling adventure for the whole family and want to enjoy a refreshing dip in the sea in between, then the Pista di Ciclabile is just perfect for you! 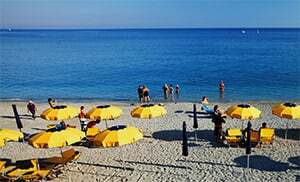 It runs right along the sea between San Lorenzo al Mare and San Remo and is extremely popular. The path is only accessible for pedestrians and cyclists. The route is flat and leads through many little towns along the picturesque Mediterranean coast of the Riviera Ponente. During the cycle tour, you will experience the enchanting landscape of Liguria up close. Cycle along the sea, undisturbed by the traffic on the parallel Via Aurelia. If you prefer not to take your own bike on holiday, you can simply hire one from one of many cycle hires. On the Pista Ciclabile for instance, you will find the cycle hire „Nolo Bici. Here, you can hire more than just bikes. They also offer accessories, tandems, trikes, rickshaws, inline skates and skateboards. So get your bike - your own or a hire one - and enjoy the breathtaking Ligurian landscape from a new perspective. Get started on your personal, sporty discovery tour! Mountain-bike: 1 hr: 3/4; 4 hrs. : 6/8; 1 Day: 10/15 Tandem: 1 hrs. :7/9; 4 hrs. : 14/18; 1 Day: 20/27 Cycle Trips: 1 hr: min 3 Persons: 10/15 4 hrs: 20/25 per Person 1 Day: 30/40 per Person Shuttle bus: min. 3 Persons, max. 50km: 30 per ride. 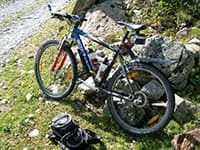 Bike Tour, Free Ride, Rental, Bus Shuttle, Mountain-bike: 1 hr: 3/4; 4 hrs. : 6/8; 1 Day: 10/15 Tandem: 1 hrs. :7/9; 4 hrs. : 14/18; 1 Day: 20/27 Cycle Trips: 1 hr: min 3 Persons: 10/15 4 hrs: 20/25 per Person 1 Day: 30/40 per Person Shuttle bus: min. 3 Persons, max. 50km: 30 per ride.